For some reason music just sounds better when its played out loud. Perhaps its because I can sing along without getting strange looks or because then I can share it with a friend. Don't get me wrong, earphones are great for public transport and walking down the street but sometimes you just want to play your favourite song so everyone can hear it. This gift is for you. Its small... actually its tiny. 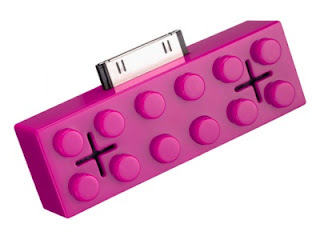 It looks like a piece of lego, doesn't require any batteries and plugs into your iPod or iPhone's dock. Perfect for the music nut who has an iPhone or iPod (isn't that everyone?) and likes to play their music out loud sometimes. Yet another great gift from Packed Full of Love's collection. If this isn't for you, why don't you browse their huge selection of gifts for men and women, children and babies and all occasions.